(August 29, 2003)  Jim McKenzie won't be pulling a New Jersey Devils' sweater over his head this fall. It's the way sports go in the new millennium - players come and sometimes, players go. But Jim McKenzie has something that no one, anywhere can ever take away from him, and that is a Stanley Cup championship. In the Spring of 2003, McKenzie was part of a team that proved beyond any doubt to be the absolute best team in the world - the New Jersey Devils. Jim McKenzie mans the bar at Tapps, where everyone knows your game. McKenzie has signed with the Predators, and last Monday, August 25, flew in from getting his new home in Nashville ready before training camp starts just a couple of weeks from now. Both the Stanley Cup and McKenzie's flight arrived simultaneously at the Regina Airport at 4:15 that afternoon. Then, it was a two-hour drive to Estevan, the home of Jim's Mom and Dad, Myrna and Larry McKenzie. Jim's family, including his sister Crystal and brother Carl, is a very close family but they certainly don't stand on ceremony. It doesn't matter that Jim is bringing the Stanley Cup into the family home - they'll bust his chops every bit as quickly as they'll take anyone else to task. It makes for very fun family get-togethers; ones where you're always advised to remain on your toes. The banter was fast and furious as the McKenzies sat down to a barbecued steak dinner. 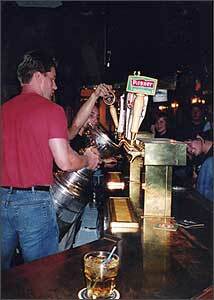 After supper, Jim took the Stanley Cup to Tapps, one of his favourite local bars. There, the town could come out and see Jim and the Stanley Cup. One woman, excited about seeing the trophy up close, pardoned herself and said, "Now tell again how you win the Grey Cup." Jim was ever so polite, grinning and telling her the Grey Cup was for the Canadian Football League championship. "This is the Stanley Cup. 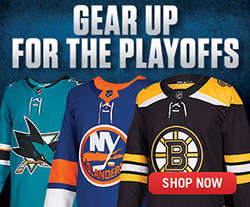 For hockey," Jim chuckled. "Never mind, then," the lady replied as she walked away. At two o'clock in the morning, McKenzie packed up the hockey trophy and took it back to his parents' place. In a special ceremony, Jim was presented with his jersey from days in the Carlyle Minor Hockey Association. Millenniums before man existed, great dinosaurs roamed the earth's crust in the area that is now south-eastern Saskatchewan, where Estevan is located. The remains of these gigantic beasts, through the immense pressure of thousands of years embedded in rock, has transformed the area into one rich in oil deposits, and it is the oil industry that is responsible for most of the area's employment. Jim's brother Carl works in oil, and on Tuesday, Jim brought the Stanley Cup to Carl's office to show the men and women. Then, it was over to visit another hockey icon - Tim Hortons. In Canada, Tim Hortons is the pre-eminent coffee shop, with thousands located in every nook and cranny across the country. Fans of a 'certain' vintage will remember Horton as an outstanding NHL defenseman who died before his time. Regrettably, a younger generation has no idea who this Horton guy is or why the restaurant is named as such. After finishing his cup of coffee, Jim packed the Cup into a waiting van and, driving through Bienfait and Alameda, made his way to the bustling hub of Carlyle, located in the Cornerstone area of Saskatchewan. 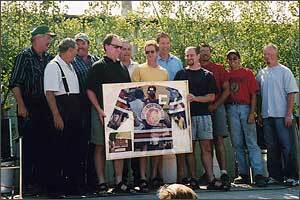 Jim played his minor hockey in Carlyle, and the town of 2,000 was ready to welcome back home one of their own. Jim sat in the back of a pickup truck with the Stanley Cup as a parade made its way down Main Street in the Town of Carlyle. 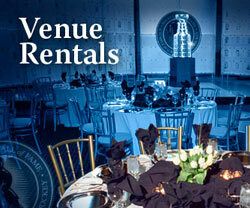 This was a wonderful celebration of hockey's grassroots. Better than five hundred fans came out to cheer for Jim McKenzie and to ogle hockey's most extraordinary trophy. The truck rolled slowly to a halt, and Jim was introduced to a roar from those in attendance. There were a number of speeches, and then McKenzie was presented with one of his original Carlyle jerseys. He was so pleased, and the crowd showed their appreciation to a local boy with a prolonged ovation. Then, Jim sat and signed autographs and posed for pictures, with the proceeds going towards the local arena. A number of the guys with whom Jim had once played stopped by to share a few memories, and McKenzie sincerely appreciated the gesture. You know that someday, ten or fifteen years from now, many of these same men will be saying, "Son, that's a picture of me and Jim McKenzie the year he brought the Stanley Cup to Carlyle. I used to play with him back in the day. Held my own, too!" 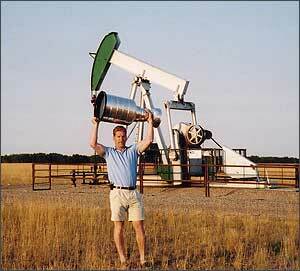 Big, strong with piston-like precision -- and the rig in the background works pretty well, too! After four hours of signing for Carlyle, Jim jumped back in the van to go to Estevan. "Hold on, hold on," he urged at one point as they drove along the rural roads. 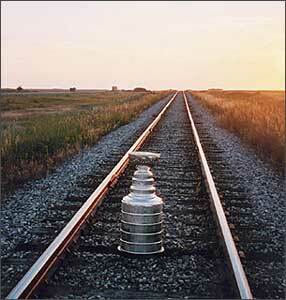 "I want to get a shot or two of the Stanley Cup in a real Saskatchewan setting." One photograph was taken in front of a field of wheat, the stalks blowing easily in the breeze. Another placed the Cup in front of a background that included a huge oilrig. "That's got 'er," Jim smiled. "Back to my Mom and Dad's!" Supper was ready at Myrna and Larry's when Jim arrived home. The banter continued, and the McKenzies had each other laughing. Jim had barely put his knife and fork down when he decided he wanted to return to Tapps with the Stanley Cup. The bar was jam packed, and the Stanley Cup was filled to the brim with beverages - first Kokanee beer, then margaritas, then rye and cokes and then Caesars. Each time, patrons would take a sip from the Cup, and then Jim would hold it for the next person. After the bowl was drained, it would be filled up again. It was 12:30 early Wednesday morning when Jim McKenzie pulled the plug on the celebration. "This has been way too much fun, but the Cup has another stop to make in Saskatchewan," the big forward explained. Jim, who was born in Gull Lake, Saskatchewan, was referring to the fact that Jeff Friesen would be getting the Stanley Cup later that day in Loon Lake, Saskatchewan. As for Jim McKenzie? After fourteen National Hockey League seasons, including stops in Hartford, Dallas, Pittsburgh, Winnipeg/Phoenix, Anaheim, Washington and New Jersey, McKenzie will get a fresh start with the Nashville Predators. "With this signing, the Nashville Predators have added a physical presence on the ice and a veteran leader to the locker room," David Poile, Nashville's general manager announced. "Jim McKenzie is an established pro who will fit in well with our leadership corps and he immediately makes us a bigger and tougher team." On Monday, the Stanley Cup arrives in Loon Lake, the guest of Jeff Friesen. Kevin Shea writes hockey book and stories from his Toronto-area home.